My library of animal reference photos is extensive, somewhere in the thousands and all worth keeping. Whenever I take pictures anywhere, I try to get them out of the camera that day or as soon as possible. I can take well over a thousand photos at the zoo, but after going through them, it’s rare that I keep more than fifty on that initial pass and I’m even stricter when I sort them into folders. While on Vancouver Island last month, I took over two thousand photos and kept around a hundred, not all of which were reference. It’s a simple question and most of the time, the answer is easy. It doesn’t mean the photo is great or even good, it might even be a little blurry with poor lighting, but for reference, I can often still use it if that special something is there. 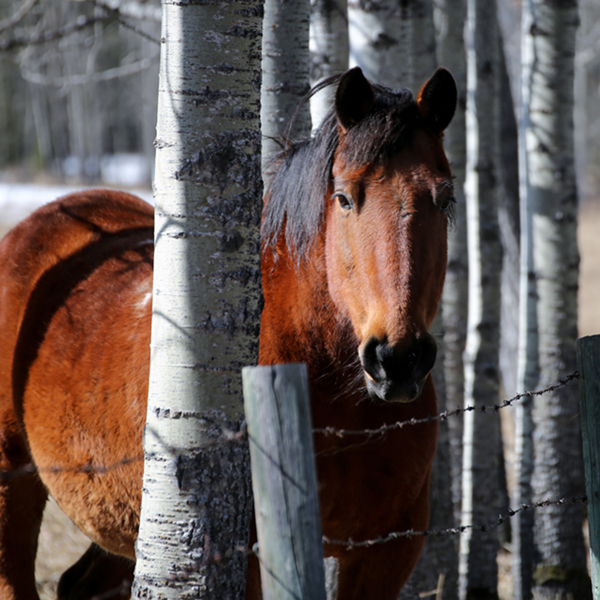 In Photoshop, I can sharpen a blurry pic, adjust the lighting in Camera Raw and turn a discard into a keeper. It won’t turn it into a good photo, but I’ve salvaged many that became good reference. True to my nature, my reference files are well organized. 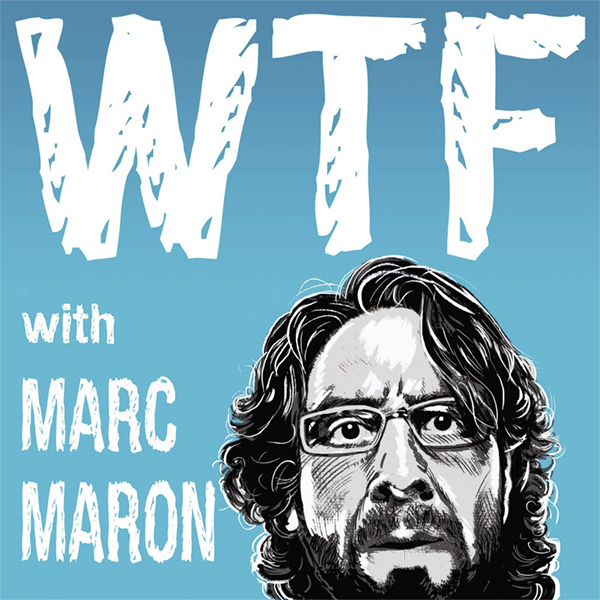 I don’t like clutter, whether it’s on my computer or in the rest of my life. I could never be accused of being a hoarder since I don’t hang on to stuff if it’s no longer useful. Ironic that I pack too much when I travel. A lot of the reference isn’t good enough for the large finished pieces that take many hours to complete, but are still worth keeping for what I call sketch paintings. Those are the images I’ll paint on the iPad or ones that are a little rougher, without any fine detail. These are paintings that will likely never be offered as prints, but are good practice and worth sharing on Instagram or in the newsletter. Over the years, there have been animals I’ve seen and photographed often, but the pictures just don’t seem right for a finished piece. I’ll get plenty of decent shots, but there’s often something missing and I keep hunting for the ‘perfect’ reference. I take photos of meerkats almost every time I go to the zoo. Next to bears, they’re the animal I’ve shot the most. I’ve done a dozen or more sketch paintings of these critters, but I’m still waiting for THE shot(s) from which to do the Totem painting. Some of my paintings, it took me years until I finally got the shots I needed. Among those are the Red Panda, Snow Leopard, and Red Squirrel. 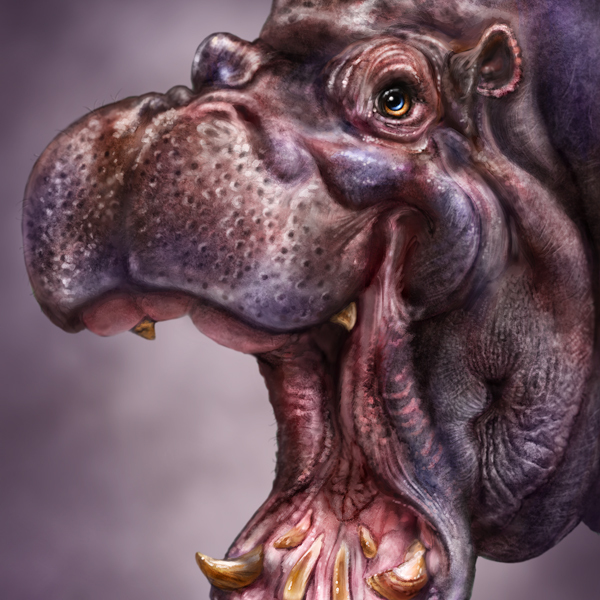 It was also the case for this Hippo painting. I like Hippos. They’re herbivores, but very aggressive. They’re one of the most dangerous animals in Africa, responsible for killing around 3,000 people each year. Seems only fair, considering that the hippopotamus is listed as a vulnerable species, due to habitat loss and humans killing them for their ivory teeth. Too many times to count, I’d visit the Destination Africa habitat at the Calgary Zoo and try to get decent shots of the two resident hippos, Sparky and Lobi. While they’re easy to see and enjoyable to watch, taking good photos proved to be quite challenging. I tried shooting through the glass of the tank when they were in the water, but I couldn’t get any decent detail. Then I tried shooting them when they were on the surface. Nothing spoke to me. 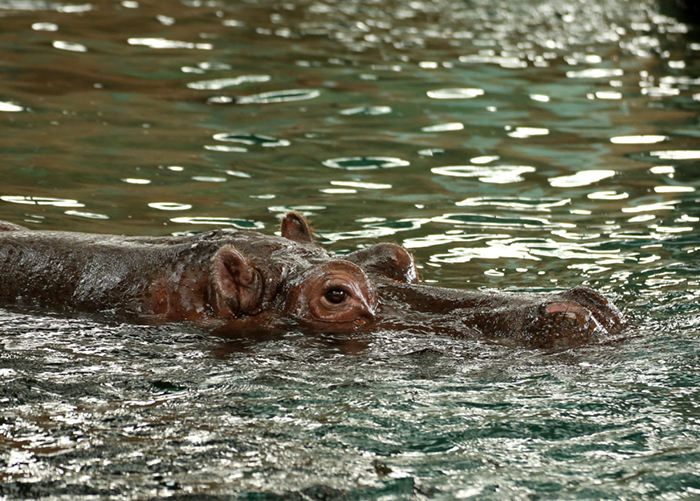 Then one day, while shooting the meerkats nearby, I heard the hippos get out of the water. Their vocalizations are quite loud and distinctive. Almost like a honking with a lot of bass. 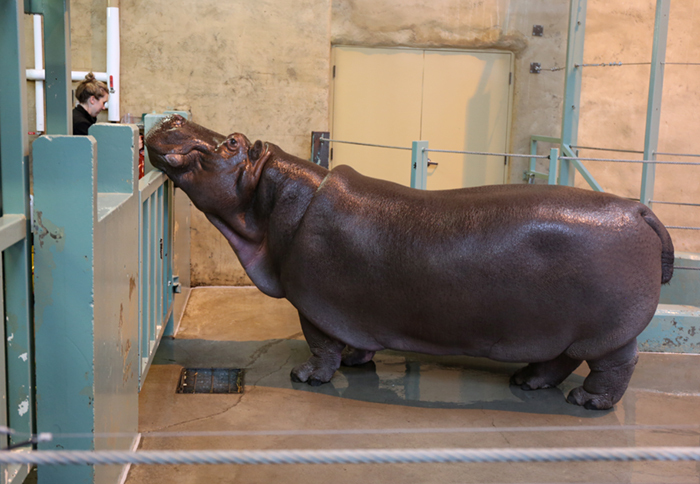 The keepers were spraying water into the enclosure and it became clear that both hippos were interested. 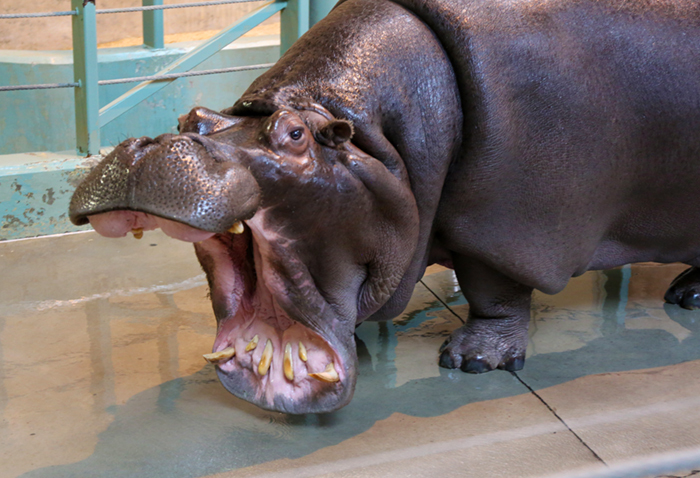 I ask a lot of questions, especially of people that work with animals, and the keeper explained that the hippos enjoy being sprayed with water, particularly into their mouths. It wasn’t long before I was getting shot after shot of that big wide mouth as each hippo invited the spray from the hose. It was exciting, knowing I was finally getting the photos I’d been looking for. 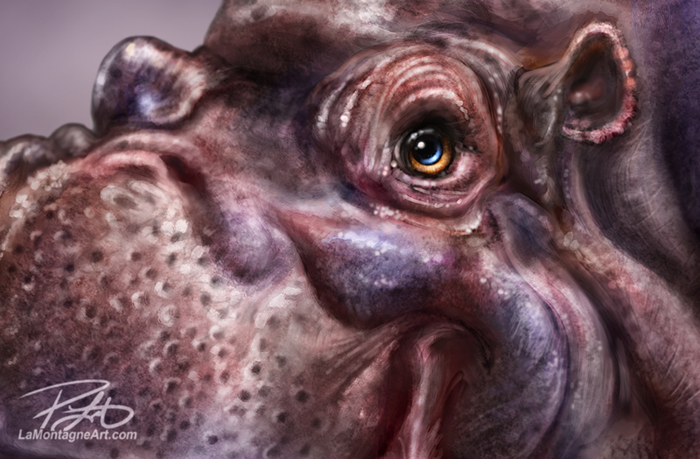 That was three years ago, and I just got around to painting the Hippo Totem over the last couple of weeks. As is often the case, I put in the final hours on Saturday morning and I’m pleased with how it turned out. With my whimsical caricatured versions of the animals I paint, I often have choices to make about anatomy. 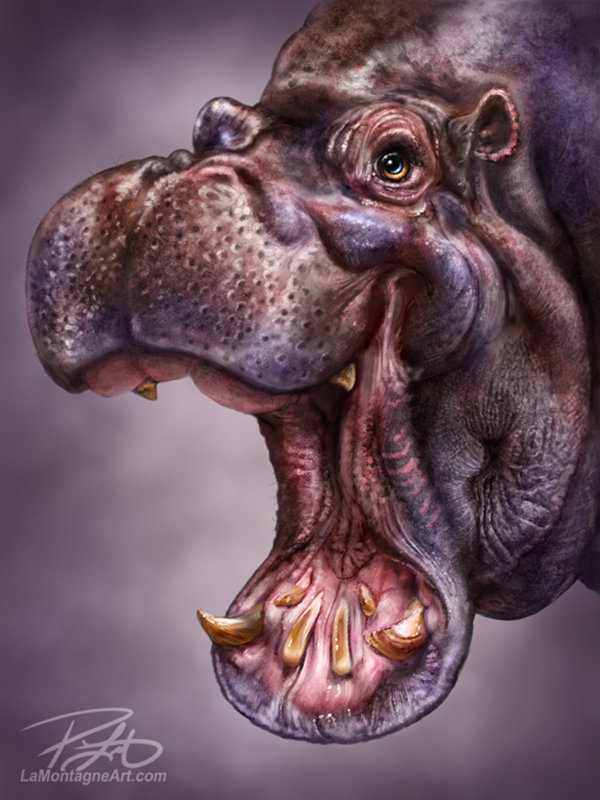 Some hippos have extraordinarily large teeth/tusks and while I did have that reference and could have gone that route, I decided to lessen the focus on the tusks in favour of the eye and the happy expression. The colour palette I chose was a surprise even to me. I began with a leafy green background, but in the final hours, I didn’t like how it looked and changed it to reflect the magentas and purples dominant in her body. It went from a complimentary colour scheme to an analogous one. One of the benefits of working digital over traditional is that making that change late in the game is easier, especially since I keep the background on a separate layer from the subject. 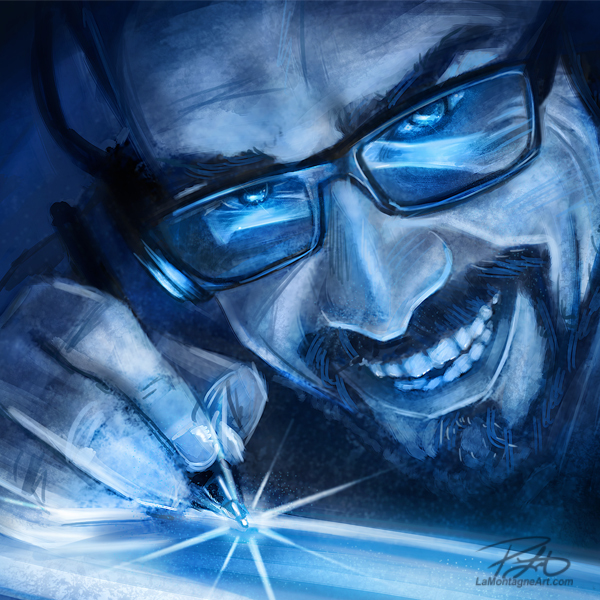 That’s some nerd stuff for you art types. Seems a little anticlimactic to finally have this one finished considering how long it’s been lying in wait. The high from finishing a painting used to last quite some time, but these days, it’s fleeting. Nothing to do but go back to the archives and see what I’m going to paint next.